The distance from Paphos Airport to Larnaca Airport is approximately 128 klms (79 miles). Many people ask if it is possible to get from Paphos Airport to Larnaca Airport directly and if so, is there a public transport service that connects the two. The answer is Yes, there is a connection bus service from Paphos Airport to Larnaca Airport and it is very easy and hassle free. However, there is also a direct coach service that operates from ‘Karavella’ the main bus station in old Paphos town but these are two separate services. Many people get these two service mixed up and get a little confused as to which is which service and where they depart from. Hopefully, this guide will help make the two services a little clearer! Basically, one departs from Paphos Airport and one departs from the main bus station (Karavella Bus Station) in old town Paphos. The service from Paphos Airport to Larnaca Airport is not direct and you need to change at Limassol. The service from Paphos ‘Karavella’ Bus Station is direct. Obviously, if you are landing at Paphos Airport and need to get to Larnaca Airport straight away, you are best to catch the service from Paphos Airport. If you are landing at Paphos Airport and are visiting Paphos for a while and then wish to get from Paphos to Larnaca Airport, you may wish to consider catching the coach from ‘Karavella’ the main bus station in Paphos. Catching the bus from Paphos Airport to Larnaca Airport requires one change in Limassol. However, if you wanted to catch the direct bus from Karavella bus station in Paphos, you would first need to catch a bus from Paphos Airport to Paphos Harbour and then another bus from the bus station at Paphos harbour to Karavella bus station in the old town of Paphos! This means it would take much longer and you would be catching three buses as opposed to two. Also, there is simply no point going all the way into Paphos in order to come back on yourself. However, if you are staying in Paphos and need to get to Larnaca Airport by bus, you have two options. You can either catch the bus from Kato Paphos or Paphos Harbour bus station to Karavella bus station in Paphos old town and then catch the direct bus from Paphos to Larnaca. You can catch the 612 Paphos Airport bus from Kato Paphos or Paphos Harbour bus station to Paphos Airport and then catch the Paphos Airport to Larnaca Airport bus. Please Note: Depending on where you are staying in Paphos, will determine which is the best option for you. This is because if you are staying in certain parts of Kato Paphos, it will be easier to catch the 612 bus to the airport rather than have to catch a bus to the harbour and then another bus to Karavella bus station in the old town of Paphos. If you are arriving at Paphos International Airport and are wishing to get to Larnaca Airport using public transport, you will need to take the ‘Limassol Airport Express’. The Limassol Airport Express is a coach service that runs at regular intervals throughout the day and connects the two airports in Cyprus. The ‘Limassol Airport Express’ coach service provides a very easy and cost effective form of transfer between Paphos Airport and Larnaca Airport. 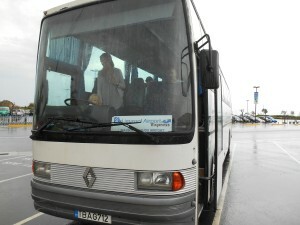 The coach service departs from outside the main airport terminal at Paphos Airport. When you have exited the airport terminal doors, the bus stops are to the right. The Limassol Airport Express coach will depart from one of the bus stops and it will normally have a small sign displayed in the windsreen saying ‘Limassol Airport Express’. The journey from Paphos Airport to Larnaca Airport using the Limassol Airport Express is approximately 2 hours, depending on traffic. If you catch the Limassol Airport Express coach service, you will need to make one change in Limassol but don’t worry, this change is very easy and you cannot go wrong. Currently, the coach departs Paphos Airport and then stops at the ‘Agios Georgios Havouzas’ bus station in Limassol. You don’t have to worry about missing your stop because this is the main stop for the bus and it is the one where everyone will get off the bus. There is generally another bus/coach waiting in the station for passengers getting off the coach from Paphos Airport and you can normally get off one bus and on to the other. However, you will need to purchase another ticket at the bus station for the next bus journey from ‘Agios Georgios Havouzas’ bus station in Limassol to Larnaca Airport. You can buy your ticket on the coach at Paphos Airport for your first journey from Paphos Airport to ‘Agios Georgios Havouzas’ bus station in Limassol. Once you arrive at ‘Agios Georgios Havouzas’ bus station in Limassol, you will need to then go and purchase your ticket for the second bus journey from ‘Agios Georgios Havouzas’ bus station in Limassol to Larnaca International Airport. You can purchase your ticket from the ticket kiosk at the bus station. The total cost of the journey by bus from Paphos Airport to Larnaca Airport bus is 18 euros (at the time of writing). Please Note: You will need to pay two fares to get from Paphos Airport to Larnaca Airport. You will need to pay for the transfer from Paphos Airport to Limassol and then the transfer from Limassol to Larnaca Airport. 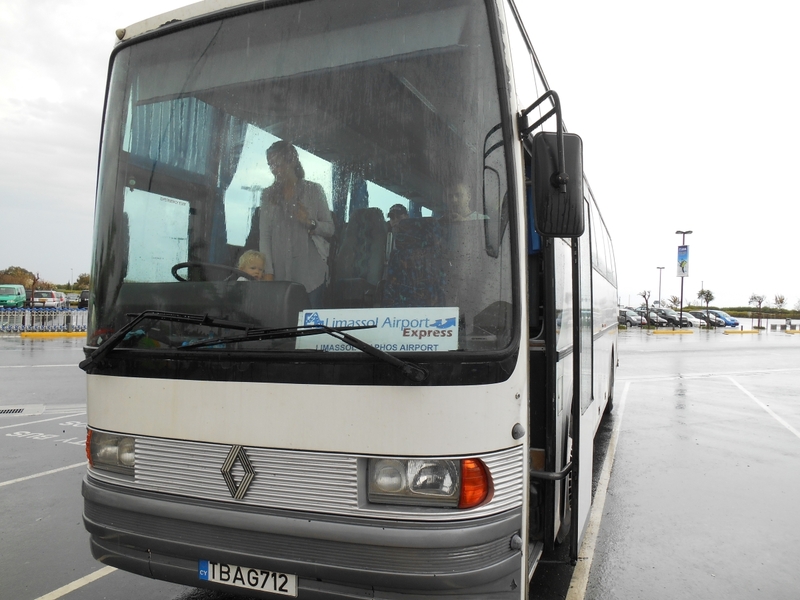 The Paphos Airport to Larnaca Airport bus is 9 euors per adult per journey and 4 euros per child (between 3-12). This price is fully inclusive of taxes and all luggage. The fare from ‘Agios Georgios Havouzas’ bus station in Limassol to Larnaca Airport is also 9 euros. Please Note: The fares of the Limassol Airport Express service were correct at the time of writing but can change. It is advisable to check the price of the fares before you travel. Despite the one change in Limassol, the beauty of the Paphos Airport To Larnaca Airport bus service is that it is literally door to door. You get on the coach at Paphos Airport outside the main terminal and you get off the coach right outside the Departures terminal at Larnaca Airport. You can then simply stroll across the walkway and straight into the main Departures area at Larnaca Airport. If you are not catching a connecting flight from Larnaca Airport and are wishing to reach another destination on the island such as Larnaca, Ayia Napa or Protaras, there are plenty of transfer option from Larnaca Airport that are available to passengers such as public transport, taxis and car hire. If you need to transfer between the two airports in Cyprus, and wish to do so using public transport, then Paphos Airport To Larnaca Airport Bus is a quick, reliable and cost effective option.